Gerontology is an ancient science! Since time immemorial Man has sought ways and means to conquer death; because, he is immortal. There is an innate urge in him to express that immortality, and to experience that immortality here and now. 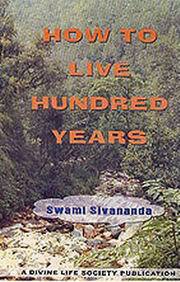 The Isavasya Upanishad enjoins upon man the duty to try to live for a hundred years, performing right actions. The Rishis had in their forest-research-laboratories discovered various methods of prolonging life-Pranayama, Asanas like Sirshasana and Sarvangasana, prayer, Havan, certain herbs, and Kaya Kalpa. They discovered that those living beings which breathed slowly, with less number of breaths per minute, lived longer, and that suspension of breathing led to hibernation and prolongation of life! They prescribed Pranayama for long life. How to live 100 years? Plain living and high thinking is the answer. The question and answer both consist of five words only; but it is very difficult to practice. Simple and plain things appear so in the beginning are very hard for practice. The tendency of man is always towards high living and low thinking. A man becomes as he thinks. A sound mind in a sound body. If the thinking is sound, body remains sound. Evil thoughts exert a very bad influence on body of self and others also. They do harm to the thinker and the thought; so we should preserve ourselves form evil thoughts and always cherish noble thoughts.